Wireless Vantage Pro2™ Plus (Sol.+UV) & 24Hr Fan Aspirated RS, Kosmos Scientific de México, S.A. de C.V.
Includes Vantage Pro2 console/receiver, integrated sensor suite (ISS), and mounting hardware. 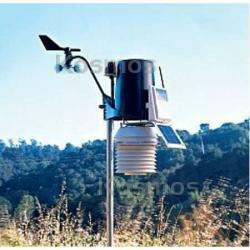 Integrated sensor suite includes rain collector, temperature and humidity sensors, anemometer, 40' (12 m) anemometer cable, solar radiation sensor, UV sensor, sensor mounting shelf, and solar panel. Temperature and humidity sensors are enclosed in our patented, solar-powered, 24-hour fan-aspirated radiation shield. Shield combines active and passive aspiration to minimize the effects of radiation.